James McNeill Whistler (1834-1903), the world famous artist, has strong ties to the University of Glasgow. He received an honorary doctorate from the University, in 1903, shortly before his death. Alongside the Freer Gallery of Art at the Smithsonian Institution, Washington, D.C, the University of Glasgow holds the foremost collections of works of art by Whistler with the Hunterian Art Gallery in possession of 80 of his oil paintings, several hundred drawings and watercolours and more than 2,000 impressions of his prints. The Whistler Collection, based on the Estate of the artist, also includes furniture, silver and ceramics, and an extensive holding of the artist’s materials. 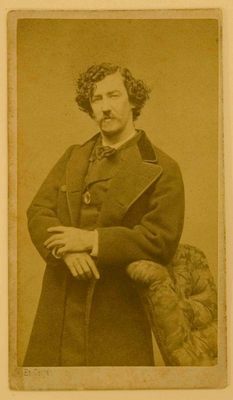 There is also an expansive Whistler Archive held in the Special Collections department of the University Library and this, the largest single collection of the correspondence and papers of the artist, comprises of some 7,000 letters written and received by Whistler. The collection also includes around 200 books from the artist’s own library, a near complete collection of Whistler’s own publications and exhibition catalogues, thousands of his press cuttings, and hundreds of photographs. The major part of this collection came to the University from Miss Rosalind Birnie Philip (1873-1958), Whistler’s sister-in-law, who inherited his estate. Whistler had an affection for Glasgow as his mother was of Scottish descent and the artist was pleased to have his work: Arrangement in Grey and Black, No. 2: Portrait of Thomas Carlyle, bought by the Glasgow Corporation in 1891. Miss Birnie Philip donated works and papers to the University in 1935 and again in 1954 with the remainder bequeathed in 1958. Other letters and documents were bequeathed in 1955 by Whistler’s great-nephew, Joseph Whistler Revillon (1886-1955). Since 1958 the collection has expanded due to the purchase of numerous other Whistler letters. The University values the collection very highly and runs many projects based on the resources for example the Centre for Whistler Studies (1992-2006) was established to edit the correspondence and support further research on the artist and his collections. The material provides fascinating documentation of the life and works of the great artist.